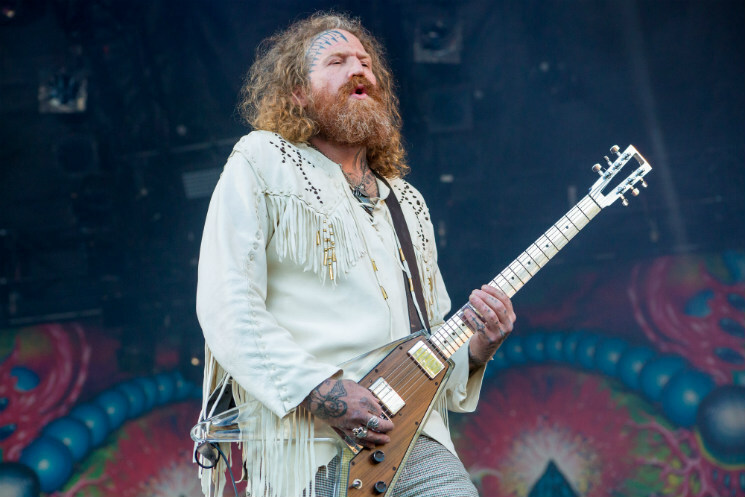 American heavy metal stoner overlords Mastodon stopped by the Molson Canadian Stage at Heavy Montreal on Saturday (August 6), making welcome amends for having to cancel their appearance at the festival last year. Opening with "Tread Lightly" from their latest release, 2014's Once More 'Round the Sun, was a good choice, as the light ambient acoustic guitar, descending slowly into a chugging void of thick bass, guitar riffs and desolate vocals, provided a great tone-setter for all that was to come. The band played a lot of material from their latest album, and given the success and airplay it has received, it resonated well with the crowd, who moshed, threw fists into the air and bellowed lyrics along with songs like "High Road" and "The Motherlode." Luscious green, purple and blue lighting took turns raining down onto the stage, creating trippy visual effects on the massive Once More 'Round the Sun album artwork at the back of the stage. In front of it, drummer/vocalist Brann Dailor sat perched at a raised drum kit, pouring countless drum fills into seemingly every available spot, in a very jazz-inspired fashion. Mastodon has a wealth of older, heavier material to pull from as well, and they scattered it through their set, particularly the back half. The frantic chaos that is 2006's "Bladecatcher" had frontman Brent Hinds and his bandmates seeming to grasp onto their instruments, clinging for their very lives. A standout performance of "Black Tongue" from 2011's The Hunter had the crowd in a frenzy.